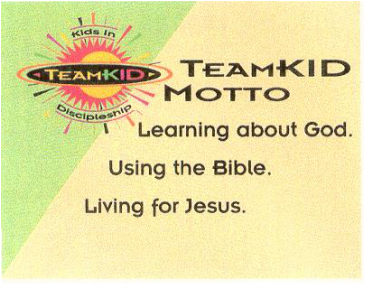 TeamKID is a fun, high-energy ministry that encourages kids to know JESUS CHRIST and to grow in a relationship with Him! TeamKID is designed for children up to 6th grade. TeamKID consists of Bible stories, mission lessons, scripture memory, life application, and recreation that all connect to teach life lessons to kids. What is the TeamKID Club? A TeamKID Club is a group of 30 or fewer children led by a head coach and at least one coach who use the TeamKID resources to enhance spiritual growth. TeamKID recognizes each child for attending the meetings, completing Bible-related work, and bringing friends with them. Because children earn stickers they can redeem for items in a TeamKID Store, accomplishments between children are not compared to one another as it would be if children earned patches or some other kind of visible reward.